Poison Spyder Hawse Fairlead Rigid 10" LED Light Bar Mounts provide winch-equipped vehicles with a convenient location to mount a Rigid Industries 10" E-Series or 10" SR-Series LED light bar.. Alternatively, it may be used to mount a pair of Rigid Industries Dually or Dually D2 LED lights, or similar small package LED lights from other manufacturers. (Each of these Rigid Industries products are avilable directly through Poison Spyder Customs). When used to mount a pair of individual lights, note that this mount locates the lights closer to the front of the winch compared to our standard Hawse Fairlead Light Mount. 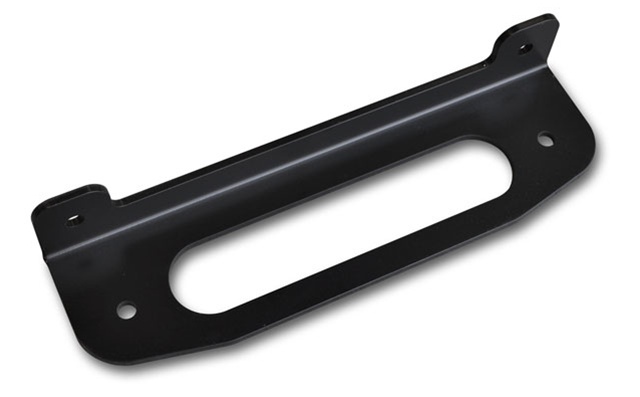 These Fairlead Light Mounts can be installed behind most Hawse-type winch fairleads. This may be beneficial for Jeeps equipped with aftermarket bumpers such as Poison Spyder's Trail Stinger™, which may displace auxiliary lights which were previously bumper-mounted. The Mount is CNC laser-cut from 3/16" plate steel and powder-coated a semi-gloss black finish for long-lasting great looks and corrosion resistance. Installation is extremely easy, requiring only simple hand tools. Complete installation instructions are included. I used this part to make a flag mount for using in dunes. Works great! Looks good, heavy built. I like it. Great product, and finish. Installed easily. Did have to enlarge the holes for the lights but that was easy enough. Perfect addition to the winch.